NEW YORK CITY, August 18 2017 – The Global Cycling Marathon Series, GFNY, continues the expansion of GFNY World with the inaugural GFNY Jerusalem to be held on April 27, 2018. Jerusalem, the holiest of cities will host riders. GFNY Jerusalem participants will race through the most historic city in the world and make their own history. 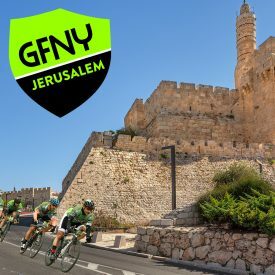 GFNY Jerusalem will also serve as the GFNY Middle East-Africa Championship. The long course serves a 2017-2018 qualifying race for the racer corral at the 2018 Campagnolo GFNY World Championship in NYC. At all championship races, top 20% of finishers in each age group qualify for a coveted start position in the GFNY racer corral for the following season.